Here’s a situation I see fairly frequently with friends and clients who are new to the Law of Attraction and metaphysics in general. They tend to not fully understand manifestation and creation in regards to the Law of Attraction and how they are the major part of that manifestation. When I’ve asked them “when are you manifesting and creating?”, most say that when they’ve created something “big” in their lives, whether it was a positive or negative experience, then that is when they were manifesting. They can see the evidence of the Law of Attraction and how it works in their lives, but their perspective is narrow, as they are only looking at these large events that have taken place. This is not unusual. Most people only really remember the “big events” of their life. Those that have impacted them in a strong emotional way. Rarely does anyone recall or remember the small things that happen on a daily basis. Because we are not taught to pay attention to everything going on around us and inside us, we tend to let those small things drift out of our consciousness. I see this as one of the blocks to our spiritual evolution, and another reason why some people have a difficult time manifesting what they want. Everything that is in your life right now, you manifested. Everything that has ever been in your life, you manifested. So what do I mean by “everything”? I mean exactly that. Everything. Every moment, every thought, every action, every feeling, every experience; you created for yourself. That’s what we are. We’re creators and manifestors. We have thoughts, which create feelings, which create desires, which create manifestations. By understanding that this is who we are and this is how we operate, we can now see that EVERYTHING we do is a creation and that it is all sacred. Does this mean you have to acknowledge every minute thing in your life? Every thought, or feeling, or action, no matter how seemingly insignificant? Of course, you acknowledge everything, but you don’t have to examine each thing separately. You can if you want to, but that would cause you to not get much accomplished, as you’d be too busy acknowledging every breath, and every heart beat, etc. No, you don’t have to go to that extreme, but you do have to acknowledge, in general, that you are the one manifesting all of these things going on, and to be grateful for them in your life. That said, I will tell you that the more you do acknowledge, appreciate and are grateful for the smaller events and experiences in your life, the more positive experiences you’ll create for yourself. This is the main principle of the Law of Attraction. Like attracts like. As you become more and more grateful for all that is around and in you, more and more circumstances will be created that you can be grateful for. Another aspect to understanding manifestation and creation is knowing what your perspective is. To illustrate this point, let me give you my favorite example. 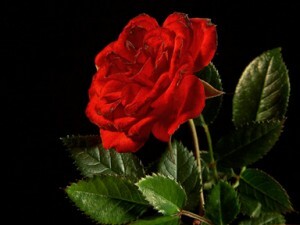 If you are looking at a rose, then what are you seeing? Well, a flowering bush that we call a rose, that has certain colors and smells and other characteristics we find pleasurable, for the most part. There are the thorns, which are not pleasurable, but if we’re careful then we don’t have to worry about them. In the main, it’s a beautiful flower, and we enjoy it. Now what if you were a farmer raising daisies? What would your perspective be then, if you saw a rose in the middle of your daisy field? Now, that is no longer a beautiful flower to be admired for it’s color and scent. No, now that rose a weed. But wait a minute, it’s a rose. How can one of the most cherished flowers in history be thought of as a weed? From the perspective of the farmer, it’s easy. The rose is not where it “should” be, and it certainly isn’t supposed to be in the middle of the daisies. This example can be applied to everything that you experience. Do you see how our perspective changes everything? To most, the idea of a single rose bush flowering in the middle of all the white and yellow of the daisies would be an interesting contrast indeed, but the farmer’s gone for the weed killer and a hoe. Once you recognize that how you see things determines your feelings about them, you can begin to change your perspective to one that is not limiting and negative. One of the fastest ways to do this is by acknowledging that you were the one who created whatever is in front of you to begin with. This will give you an opportunity to re-examine your perspective on the object, person or situation and change it to a more positive one. If it’s something that is “perceived” as a negative, then forgive yourself, let the negativity of it go, and even if you can’t see anything particularly positive about it at the moment, at least get as neutral to it as you can. Once you practice this, you’ll see how your feelings and perspective changes about everything around you. You will begin to bring in much more positive experiences into your life. By understanding that you create it all and that you have the ability to change your perspective, you will allow yourself to see more than you’ve seen before. You will give yourself a view of your life that is clear and uncluttered. You will give yourself a level of gratitude and love higher than you’ve ever experienced. In turn, your prosperity and abundance, on all levels, will grow tremendously. In this last part, I want to talk with you about what I believe is the number one thing that you have to have, use, feel, and be if you truly want to manifest anything in your life. To this end, I want to tell you two stories about how I came to understand this particular idea that completely changed how I view, not only my life and how I live it, but everything. To begin, I need to go back to 1973 when I was 15 years old, and had first developed my own metaphysical philosophy. I had just started exploring the writings of every known metaphysician of the time, and allowing myself to understand my abilities, even if I wasn’t “in control” of them as yet. While the majority of the books were beyond dull for the most part and written in stylistic language, I got the concepts of what they were saying. Combining that with the various ideas from the science fiction books I constantly read, I came up with my first true belief system. Others along the way have also written of this concept, but as far as I know I’m the only one who looks at it in this particular way. My concept is simple. I think of Source Energy, The Divine, God, All That Is (what ever you choose to call it) as a diamond of infinite size with infinite facets. Each facet is a life, or life time. We look out through a facet and observe and experience “our life”. Because we are only looking through one facet, we are limited in what we can see and experience. By using metaphysical techniques such as meditation, we can actually turn our “mind’s eyes” inward and see that indeed, we are all one thing. That we are aspects of Source Energy, which is experiencing itself through our experiences. For years, I thought that this philosophy was fairly complete and I didn’t see the need to add or subtract anything from it. Even the Native Americans had a saying for what I believed. The Lakotah say “Mitakuye Oyasin!” which means “We are all related”. And they mean related to everything. They pray to the animals, and the plants and the insects and stars and everything and call them “brothers” and “sisters”. I fell in love with the Lakotah way and incorporated their beliefs and teachings into my daily life. Then, a few months ago, everything changed. The energy and impact of those words reverberate through me to this day. Allowing myself the understanding and true meaning of that simple sentence changed how I perceived everything. It not only drove home in a much deeper way our connection to all things we consider “living”, but to ALL THINGS THAT ARE! We use the term “inanimate” because to our eyes, certain objects are not moving. Physics says everything vibrates and moves, even if it takes sophisticated scientific equipment to see the actual vibration. You see, it’s always a question of our perspective. We tend to see and experience only what we allow ourselves to “see”. Once we let ourselves truly see, then we widen our perspective and can experience even more of this life. This simple sentence allowed me to experience a sense of gratitude deeper than I’ve ever felt in my life. I became instantly aware of the living presence that is everything. I came to the realization that everything that is in my experience was sharing it’s experience and “life” with me. From the computer desk where I write this, to the newly sprouted weeds in the backyard, to everything you can name; it’s all sharing it’s life with me, right here, right now. Since that day, I carry with me an immense feeling of deep gratitude for everything that is. I constantly say “thank you for sharing your life with me” to everything around me. I am so profoundly grateful for everything I am, everything I was, everything I will be and for everything I experience, whether that be an object, a person or a situation. Once you start to incorporate this idea into your life, your perspective will change as well. How you perceive and experience everything will change. Once you come to the realization that this is the main thing that is happening all around us; that everything in our experience is sharing it’s life with you, your level of gratitude will absolutely soar! If you know this, feel this, BELIEVE this, everything else will fall into place. Even if you do nothing else in your life, this simple act will increase your abundance on all levels. By understanding that we are all here together; that there is no real separation; that everything is ONE! then you will have aligned yourself with Source Energy in such a powerful way that everything you want and desire cannot help but be made manifest in your experience. This is, in my humble opinion, the most powerful thought, act, way of being that will improve every aspect of your life. By having this level of gratitude for all things in your life, you are in reality saying “I love you” to all that is. Nothing is more powerful than that. Nothing is more fulfilling than that. Nothing is more sacred than that.